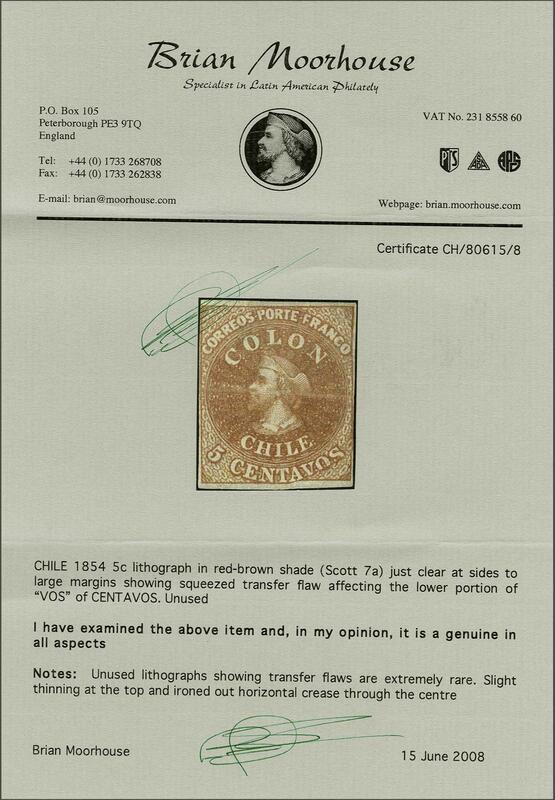 Lithographed by Henri Gillet 1854 (April-August): 5 c. red-brown, wmk. pos. 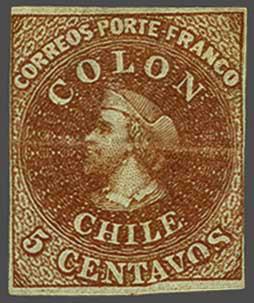 3, a fine unused example with good to just shaved margin at top, of good rich colour, slight ironed horizontal bend, position 62 on the sheet showing the Lithographic Transfer variety with frameline bent at base and "VOS" of "CENTAVOS" crushed, Blank 5/Vt 3/3, fresh and very fine: all Lithographed Transfer varieties can be considered great rarities. Cert. Moorhouse (2008).rnProvenance: Collection Joaquin Galvez, Corinphila sale 62, May 1979; Collection 'Islander', Siegel, June 2008, lot 148.